2002 GL1800 Owners check in ! Giving you the short version....... over the years I worked my way up from a GL1200, then GL1500 and eventually to a 2009 GL1800, when my 2 adult sons convinced me to go HD Ultra in 2012. At this point you're going EEeeeeeek! 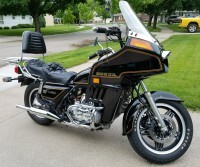 My current stable now includes a 2015 Road Glide, but in the last 2 years picked up a clean 1982 GL1100 (27K actual with original matching Hondaline fairing) and alongside that more recently a clean 1991 GL1500. I have them both running like tops with all the carb work, water pumps etc done. At my advanced age of 59.5, the Gold Wing appreciation is back and they're getting more riding time that the HD. The HD is paid for and I'll likely keep it, but I found a clean 2002 GL1800 and wondered what actual owners experience has been with the 2002 model year. Any weak points to be aware of? Thinking I may sell the '82 and the '91, picking up this '02 along the way. Wife says I can't have 4 motorcycles.....(but maybe I could hide it somewhere LOL). Anyway, comments on '02 ownership greatly appreciated. Re: 2002 GL1800 Owners check in ! 2002 here with 114,000 miles. Previous owner was meticulous with service, I have all the documentation from him. The 2001 through the 2005 have smaller radiators than the 2006 and later. This makes them prone to overheating on warm days when traveling at less than 25 MPH, particularly up hill or in stop and go traffic. that has only bothered me one time, got caught in St. Louis once in a traffic jam, it got up almost to the red, but the fans cycled on and off, no problems. Thank you for your comments thus far Gents. My son recently purchased a lightly used (37K) '03 which is nearly the exact same model with a new color. 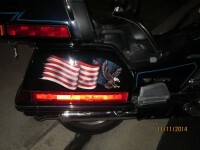 The frame crack check, brake service, and a few others - have them done and ride ! Had an 02 and loved it.Never a problem. But there were a few recalls on them. frame re weld and over heating issues. S VIN run from a dealer can tell you if they have been done.